This project will be demonstrated at Wired NextFest 2006 on Friday, September 29, Saturday, September 30, Sunday, October 1.
more images A real-time water simulator with a pre-computed database of 3D fluid dynamics. The system simulates a real-time wave model with a database for complex and fast-flow areas around objects that creates realistic wakes and force feedback of water resistance. Virtual Canoe introduces realistic and interactive water into virtual worlds with haptic characteristics that enhance intuitivene interaction. Many real-time simulations of rigid and soft bodies for realistic haptic interaction have enhanced virtual experiences. Virtual Canoe extends this principle into science, engineering, and entertainment applications. 1. Invention of a real-time fluid model for virtual reality. 2. Invention of real-time visualization and haptization methods for the real-time fluid model. 3. Understanding of fluid-phenomena simulations in engineering. 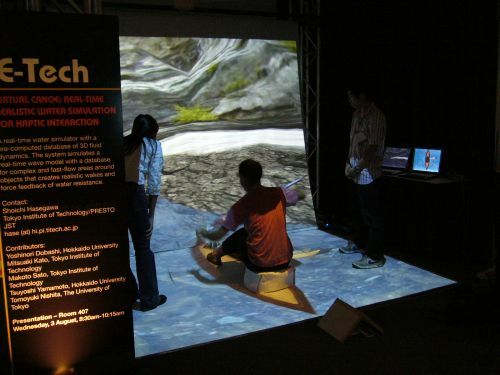 Virtual Canoe combines a pre-computed database and a real-time simulation. Both components are required to establish a realistic waveform. The real-time component is just a wave-function simulator, so it simply transmits water pressure and velocity. The pre-computed database provides a force pattern for a point on an object's surface at a constant input velocity. The pressure from the database affects the velocity of the water in the real-time wave simulation, which keys the query to the database. This enables the system to create a realistic waveform. It carefully decomposes the original Navier-Stokes equation into a simple real-time function and a complex pre-computed function considering the area and the phenomena. Many phenomena are represented by differential equations. Engineers need to understand the implications of these equations to describe a phenomenon, understand it, and apply it to real situations. In developing Virtual Canoe, non-linear differential equations were converted into simple linear differential equations and a pre-computed database. Then the system ran them and found the difference between the simulation and the real phenomena, and corrected the simulator. This process revealed implications of the original non-linear equations. The development process demonstrates that creation of real-time simulations requires understanding real-world phenomena. Any research focused on undertanding real phenomena can be applied to create realistic virtual worlds, and virtual reality is a very good way to understand the real world. There are still many phenomena that cannot be portrayed in virtual worlds, but deeper understanding of the real world will expand virtual reality's application and credibility. for the lead and help of submission and demo creation. for the help of demo creation. for good video clip of real canoe scene.